Alan Pardew has revealed that he did not want Fraser Forster to leave Newcastle United – as the Hexham-born goalkeeper prepares to become a full England international. Roy Hodgson is set to hand Forster his first cap on Friday against Chile as the Three Lions assess alternative options to Joe Hart, who has been dropped by Manchester City after a run of poor form. 6ft 7ins Forster was born and bred in the North East and was with the club’s Academy from 2005 until he left permanently in 2012 for a fee believed to be around £2million. He didn’t make an appearance for Newcastle and was allowed to leave on loan after the club decided to elevate Tim Krul in the summer of 2011. Forster’s rise to prominence while at Celtic has re-opened the debate about whether United should have worked harder to try and keep the homegrown stopper, although Krul’s incredible performance at White Hart Lane was a timely reminder that he faced stiff competition in the battle for the number one slot at St James’ Park. Pardew naturally feels that United made the right call in sticking with Krul, who he feels “had the edge” on the 25-year-old at the time. Even so, the United manager insists that if it was up to him, the club would have kept Forster on Tyneside. He said: “Let’s get one things straight about Fraser, we didn’t want to lose him. But Fraser was absolutely adamant that he wanted first-team football and we couldn’t provide him with that. Although they have had a steady succession of talented goalkeepers, Newcastle have not had an England goalkeeper since March 1901, when Matt Kingsley played a single game for the national team against Wales. Even though Forster’s elevation in different colours would represent a missed opportunity for the club, Pardew insists there is a genuine excitement at the prospect of one of their own pulling on an England jersey in a World Cup year. And if he does make the grade, Pardew is absolutely adamant that Forster will be at home as an international. 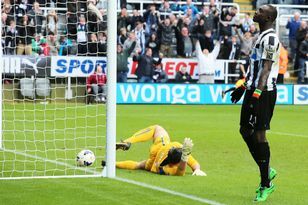 “He’s such a big frame in the goal, and that’s probably his biggest asset,” the Newcastle boss said. “He can reach right into the corners of the goal to make fabulous saves when other goalkeepers might struggle to get up there. We’re all chuffed for him because we really liked him as a guy. Unfortunately, it was just a case of the timing not really working out. Forster comes from an untypical background for a footballer – father Brian is a High Court judge at Newcastle Crown Court and he was a student at the Royal Grammar School before his football career took off. Pardew thinks his character is suited to play international football. He said: “I only had him for a short period, but he was always a confident guy, very assured about his ability.